i-Neighbour is a cloud-based residential & visitor management system, designed to streamline the check in and check out processes for visitors on top of managing residential matters like facility booking, maintenance fee payment and etc. With its simple online sign-up process, guests can pre-register their visitation and have it approved by the resident they are visiting – with just a few touches on their smart phones. 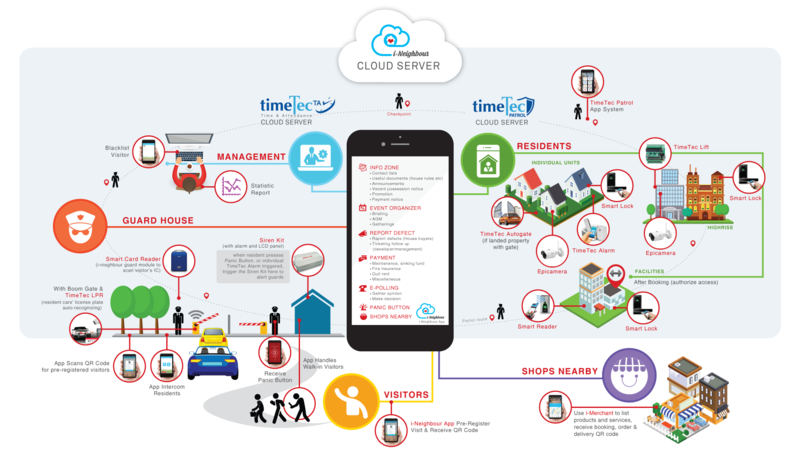 To complement the system and making it a smart system for the community, TimeTec introduces i-Neighbour IoT and BLE Smart Security Series with various device selections for better security and automation, plus control from i-Neighbour App on your very own smartphones. Integrate this reader with i-Neighbour Security Guard Module as an option to read the visitor ID cards’ data for smooth visitation and error free system. Cloud Surveillance for individual homes and public areas, can be integrated with i-Neighbour App for LPR. Automate car plate recognition for residents’ registered cars and capture visitors' plate numbers for security purposes.